Prior to joining the Shelter Medicine team, Chrissy served as Director of Operations for Alachua County Humane Society in Gainesville, Florida. In this role, she put her community and creativity-driven background to work to serve people and animals in the North Florida region by developing programs to optimize shelter operations, increase shelter lifesaving, and deepen regional collaborations. Chrissy earned her Bachelor’s Degree in Advertising from the University of Florida and a degree in Digital Media from Santa Fe College. 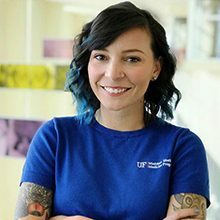 Chrissy also completed the online Master’s in Veterinary Medicine Science with a concentration in Shelter Medicine from the Maddie’s Shelter Medicine Program at UF. In addition to her work, Chrissy serves as an Animal Rescue Volunteer for the Humane Society of the United States in support of large-scale animal transports, disaster response and cruelty investigations. Chrissy lives in Gainesville with her husband Brandon, their two rescue dogs and four cats.